My partner Mario and I, created a survey that collected data about the health and economic opportunities lost due to incarceration in LA jails. A big problem inside jails is the fact that there are inmates who instead of getting help, the doctors in the jail just stabilize it. Also how when inmates are released from jail it is hard for them to not go back to the life they lived that got them in jail in the first place. The question we will solve with this data is how does jail affect the health and economic opportunities of former inmates.How we will solve this essetial question is by doing a survey and using the data we find to answer the question. In the survey my partner and I made, most rated the medical care received in jail as terrible. According to Zawn Villines, “Jails and prisons are required to provide basic health care for inmates, but the quality of this care varies greatly. Often, prison-based mental health care focuses on stabilizing, rather than treating, inmates. A person experiencing hallucinations or psychosis might get medication to control the most severe symptoms, but people with Anxiety issues,depression, post traumatic stress, and other mental health conditions that don’t cause radical changes in behavior may go untreated” (Villines) To me this shows how bad prisons struggle with dealing with inmates who need help with their illness not stabilizing it. The question, then, is how are former inmates’ health from Los Angeles County affected by incarceration? Being incarcerated can bring many problems to the inmate’s life besides worrying about their families or children. All that time being locked up can affect their opportunities to get their life together outside of jail. The major problem they face is leaving the jails in general because due to all the time they waisted a lot of money was lost plus they lost skils to communicate with others well, all they gotta do is go out and try to find a job. Jails can affect the health and economic opportunities of an inmate by taking the skills of an inmate by taking the skills of being able to communicate with others with out feeling in danger or threaten, and its hard for them to try and get a normal job because everywhere they go they will check their background, witch it makes it really hard for them to get their life back on track, when they are in jail , they may also loose their job/wages. The method I chose was a survey. I thought this survey was very informative and productive for the campaign. My results reflect the experiences of people who have been to Los Angeles county jail, not other jails. Doing the survey I read a couple of articles to help me develop questions for the survey. A question asked in the survey was did you ever develop a health problem coming out of jail that you didn’t have before entering? The hypothesis I developed was yes and that Hepatitis C was gonna be the most picked answer. Also another question in my survey was did you need medical care while in jail? My hypothesis would be a overwhelming answer of yes. Surprisingly no one chose hepatitis C. In a lot of the articles i read before doing the survey, hepatitis C was the one of the most common Infectious Disease to get while in jail. According to CDC.gov, “After adjusting for under-ascertainment and under-reporting, an estimated 30,500 acute hepatitis c cases occurred in 2014” (Center for Disease Control).My hypothesis of a overwhelming yes answer of in did you need medical care in prison was way off. I received one vote shy of 50%. Reason being was because in a place full of prisoners with big egos i thought that their would be a scuffle or two that would need medical care but i was wrong.The results changed my perspective of how jail can affect someone’s health. For example, like a lot of people who went to jail got out of jail developed a drug and mental health illness according to our survey.The trauma developed in jail makes it hard to forget their experience in jail and wasn’t treated well. Reason being because it either went untreated or stabilized not helping the person with the illness in the jail. Also don’t help the inmate on what to do after jail to help their illness. The essential question we asked was how does jail affect the health and economic opportunities of former inmates. Our survey asked about the health and economic questions that answered the essential question. 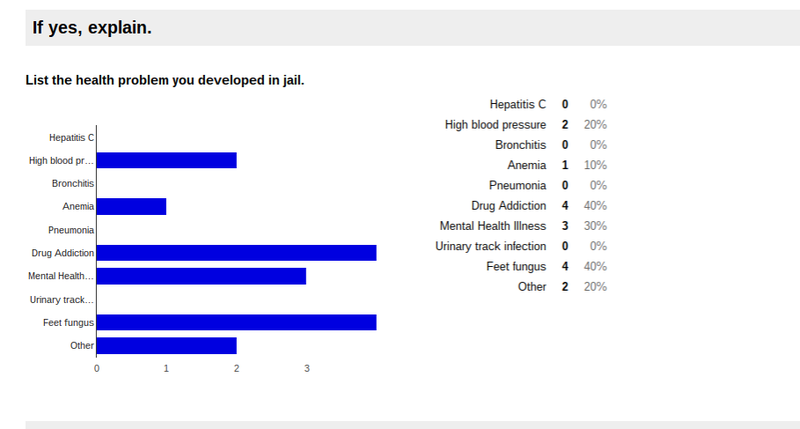 For example a question i asked in survey was if you developed a health problem coming out of jail what was it? Options like mental health illness and drug addiction where the most popular. I can imagine is a daily struggle for someone who is trying live a normal life to improve their life after jail. We didn’t really get a lot of responses in our survey to really find the issue. What we could have done different was going and getting more people to answer the survey. We could have done more outreach by going and waiting outside Los Angeles Jail and asked newly released people from jail to answer the survey. Final thoughts about doing the survey is that it was a very cool experience and i would recommend it and do it again. In my opinion this survey was important because it shows how the ex L.A county inmates were affected by their incarceration. What really caught my attention was that a lot of the inmates were released with drug addiction, and high blood pressure. Many were also charged with fees and fines. Without a job their fees would be nearly impossible to pay. All of these things can make it hard for inmates to rebuild their lives. Others are going to look at them as “criminals” and not give them a chance to earn money in a clean way, especially if they had drug addictions that can make them do things that may cause them to go back to the L.A county jails. Villines, Zawn. “The Effects of Incarceration on Mental Health.” GoodTherapy.org Therapy Blog. Good Therapy, 2013. Web. 09 June 2016. “Data on common health problems on medical problems” CDC.gov. 2016. Web. 17 May 2016.